Egypt has postponed parliamentary elections originally set to start in less than three weeks, after the country's highest court struck down one of the laws regulating the electoral process. On Sunday morning, Egypt's Supreme Constitutional Court (SCC) ruled that the country’s Elections Constituency Division Law is unconstitutional. Shortly after the SCC issued its ruling, a spokesman of the Higher Electoral Commission (HEC) said that the parliamentary elections, previously scheduled to start on 21 March, would be put on hold for the time being. Omar Marwan told the press that HEC would convene for an urgent meeting to discuss the consequences of the court verdict. "Article 3 of the Law 202 for the year 2014, which regulates the individual seats system for the house of representatives is unconstitutional," SCC Judge Anwar Al-Aasy announced in a SCC session aired on state TV. Egypt's president Abdel Fattah El-Sisi issued a statement on Sunday afternoon, urging the cabinet to amend the law within a month. Egypt has been without a parliament since the house of representatives elected in late 2011 was dissolved in June 2012, following a court ruling that judged the law regulating its election to be unconstitutional. Egypt's President Abdel-Fattah El-Sisi holds legislative powers until an elected parliament convenes. The petitioners against the constitutionality of the law have argued that it violates the principle of fair, proportional representation of all voters. Meanwhile, the court rejected the lawsuits filed against the Law of the Exercise of Political Rights and the Parliamentary Elections Law, both also issued in 2014. The court had heard four lawsuits which challenged the constitutionality of three laws: the Law of the Exercise of Political Rights, the Parliamentary Elections Law, and the Elections Constituency Division Law. According to the upheld Parliamentary Elections Law, the House of Representatives is comprised of 567 seats: 420 will be elected as individuals, while 120 are reserved for party lists. Five percent, or 27, of these seats will be appointed by the president upon recommendations from respective state councils and professional syndicates. 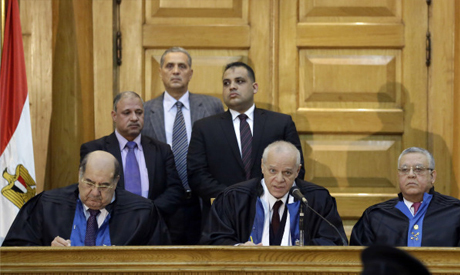 The SCC ordered the Egyptian cabinet to pay an amount of LE200 in attorney fees. Parliamentary elections constitute the third and final step in a political roadmap set forth following the ouster of former Islamist president Mohamed Morsi in July 2013. The first two steps included passing a constitution in January 2014, followed by presidential elections in June 2014. Once a parliament is elected, its members will have to vote on all laws issued by El-Sisi and his predecessor, interim president Adly Mansour.